Courtesy of PREMIER SOTHEBYS INT’L REALTY. 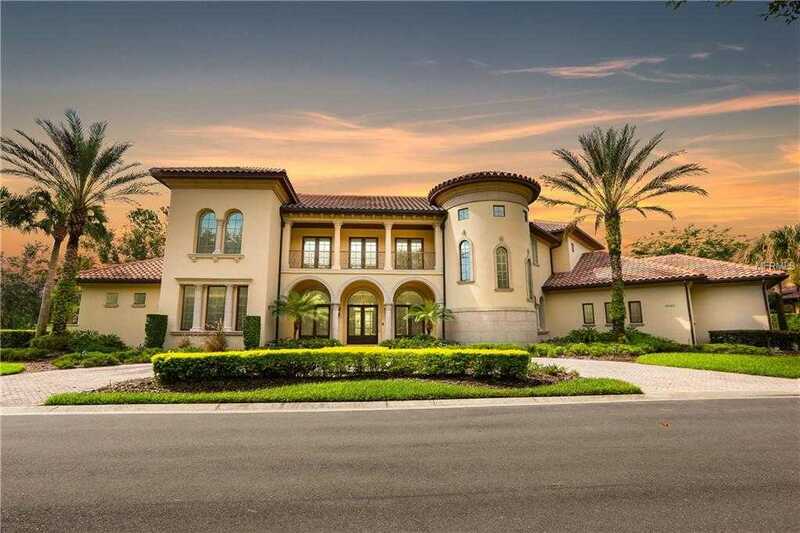 Located in the world class Lake Nona Golf and Country Club and situated directly on the 12th green, this exceptional 7,400-square 8211;foot estate was crafted by builder Maroon Fine Homes. With Mediterranean inspired architecture, circular drive, motor court and two two-car garages, it has been constructed with the finest finishes. Enjoy custom cabinetry, built-in bookcases and moldings, handcrafted ceiling details, custom wall treatments, granite and marble throughout, travertine and hardwood floors. There are two master suites and three additional en-suite bedrooms. Move into the generous entryway flowing into the formal rooms with cast stone, gas fireplace, ample dining area, and wine cellar. The gourmet kitchen has an expansive center island, dual Sub-Zero refrigeration, six burner Dacor gas range and hidden walk-in pantry. The adjacent butler 8217;s pantry is equipped with wine refrigeration and ice maker. The large office is meticulously designed with built-in bookshelves and has an abundance of workspace. An elevator or spiral staircase takes you upstairs, where there is a game room and wet bar, opening to an expansive balcony with long range views of the golf course. Next to the game room is a home theatre for viewing pleasure. Outside, an oversized covered loggia with summer kitchen and outdoor fireplace complement an open-air pool and spa, perfect for enjoying the Florida lifestyle. Please, send me more information on this property: MLS# O5721695 – $2,350,000 – 9680 Sloane St, Orlando, FL 32827. I would like to schedule a private showing for this property: MLS# O5721695 – $2,350,000 – 9680 Sloane St, Orlando, FL 32827. This content last updated on April 23, 2019 22:00. Some properties which appear for sale on this web site may subsequently have sold or may no longer be available. Information herein deemed reliable but not guaranteed, representations are approximate, individual verification recommended. IDX information is provided exclusively for consumers personal, non-commercial use, that it may not be used for any purpose other than to identify prospective properties consumers may be interested in purchasing. This content last updated on April 23, 2019 22:00. Some properties which appear for sale on this web site may subsequently have sold or may no longer be available.